Santa, Our National Patron Saint!! A patron saint is defined as a mythical and revered guardian figure of a people or country. Who, I ask, is the patron saint of the United States? George Washington? Since he is a relatively recent historical figure, he is subsequently disqualified – we understand Washington and others like him (Jefferson and Franklin) to be founding fathers. Johnny Appleseed, Paul Bunyon, or John Henry? We’re getting closer, but most American kids would recognize only one of the three, at best. How about Uncle Sam? He looks the part in red, white, and blue – but what more do we know of him than his finger pointed beckoning citizens to national service? To be a national patron saint, all – especially children – need to understand the details of the candidate’s story. Santa is the only one who qualifies; he, unquestionably, is the American national patron saint in this current day of commerce, materialism, and consumerism. 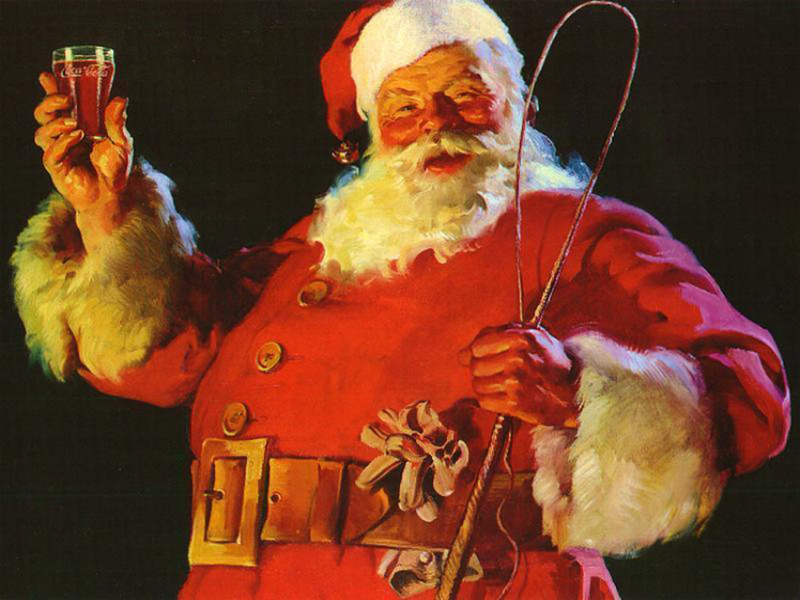 Santa – unequivocally an American invention – has an interesting history. It starts with St. Nicholas (270-343), a Christian bishop who lived in Myra – modern-day Turkey. He had a reputation for favoring children; he brought them justice and gave them gifts. A depiction of St. Nicholas of Myra. Notice the bishop’s mitre, the shepherd’s staff, the cross, and the religious vestments. The date of his death, December 6, became his festival day. For centuries, various places in Europe revered the saint and practiced gift giving on his festival day. But we’re getting ahead of ourselves if we make a direct unbroken link from St. Nick’s December festival day and its practice of gift giving to the Christmas of today. More so, there’s a deeper connection between today’s gift giving and the ancient rhythms of indulgence (sometimes to the point of excess) during the winter months. The winter solstice, December 21 – the shortest day in the Northern Hemisphere – has a deep and long cultural history. The celebration of greens and lights at the solstice, as is well-known, predates Christianity by millennia. The early church, not yet consolidated in doctrine and calendar, celebrated the birth of Christ on different dates throughout the year according to local custom. Constantine corporatized the church in 325, bringing conformity to its doctrine. Pope Julius brought consolidation to its calendar in 350 and proclaimed December 25 to be the festival day of the birth of Christ. The church understood its position to be strong enough to compete with Saturnalia and other pagan festivals celebrating the rebirth of the sun, covering over them, as it were, with the birth of the Son. Historian Stephen Nissenbaum (The Battle for Christmas, Knopf, 1997) astutely observes that “Christmas has always been an extremely difficult holiday to Christianize.” Absolutely correct. Protestantism’s penchant to not revere saints meant that St. Nick didn’t make the trip to the New World neither with the Pilgrims, the Puritans, nor northern European immigrants (Nissenbaum says that American Christmas as an early 19th century Dutch import is an “invented tradition”). As a matter of fact, Christmas celebrations in early America had more in common with the ancient celebrations related to the rhythms of harvest and the solstice than they did with church teaching. In the Northern Hemisphere, the weeks preceding and following the solstice (what we moderns call November, December, and January) traditionally have been the time of gathering in harvests, slaughtering for fresh meat, and enjoying the products of fermentation, beer and wine. We Northern Hemisphere moderns who purchase fresh apples from Chile in May might have difficulty understanding this ancient rhythm, since we are able to procure most whatever we want any time during the year. Even so, let me ask you to entertain a few questions: Do you have a tendency to put on a few pounds over the winter holiday season? Have you ever signed up for a gym membership in January? December was and is the time for excess – eating, drinking, giving, celebrating, leisure – a time to enjoy the labors of year-end and a time for misrule. Misrule, historically, was a moment of social inversion when the wealthy and powerful deferred to their dependents and poorer neighbors. Practiced in Europe and early America, misrule gave social permission – during a few days in December and January – for the poor to enter the homes of the well-to-do demanding to be served with food, drink, and money as if the peasants themselves were the well-to-do. Misrule consisted of rowdy public displays of excessive eating and drinking, the mocking of established authority, and demands made upon the rich by the working class. Now bring us some figgy pudding . . . We won’t go until we get some – and bring it right here! The Puritans of New England – yes, it’s true – banned the celebration of Christmas in the mid-1600s not because they had issues with the legendary December birth of Jesus, but because misrule had a tendency to get out of hand. So bring it right here! One of the unwritten rules of misrule, however, was the continuation of a social bargain. The peasants, satisfied with the brief turning of the tables during misrule, were to offer their goodwill and deference to the wealthy and powerful for the rest of the year. If you’ve ever received a Christmas bonus at a job where you felt you were underpaid, you can see that misrule is still with us. It’s the misrule bargain: accept your once-a-year bonus and do not grumble about your low pay for the balance of the year – a gift given in exchange for goodwill. Misrule became domesticated in mid-19th century America: peasant and working-class folks were pushed aside as children became the season’s focus of charity and display of social inversion. Christmas celebrations would newly consist of private family gatherings inside homes; roving bands of young men pounding on doors and demanding the spoils of misrule disappeared. Gift giving – ah, the memory of St. Nick yet alive – was rediscovered and the church was most pleased to be part of a toned-down, family affair focused on another child, the babe of Mary. Not all churches in mid-19th century America held Christmas services. That began to change, however, and the societal move away from excesses so ingrained into the season by climate, culture, and practice was gaining momentum – until, that is, Sinterklaas took on American shape and form. Sinterklaas, Dutch for St. Nicholas, became Americanized awfully fast. 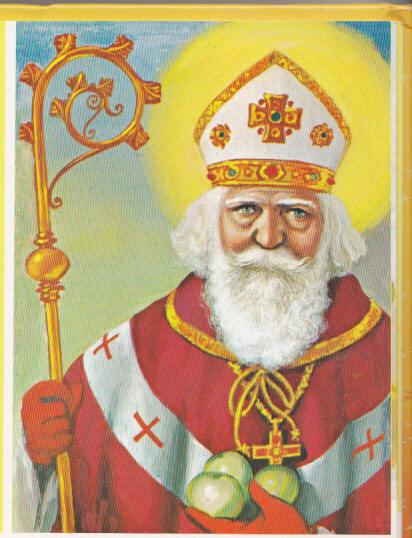 The Dutch version of St. Nicholas was transformed significantly to become the American Santa Claus: stripped bare of all religious symbolism and enhanced according to the traditional seasonal excesses. No mitre, but a cap; no shepherd’s staff, but a whip for his reindeer; no crosses, but gifts galore. The cleric red vestments were replaced by a snowsuit, covering an extensive paunch. As a matter of fact, depictions of Santa show his belly growing larger and larger as the mid-19th century gave way to the Gilded Age (1870-1900) and its proliferation of excess. Our modern Santa – with a little commercial backing. James Farrell (One Nation Under Goods: Malls and the Seduction of American Shopping, Smithsonian, 2004) calls Santa the most appropriate icon for an affluent society. Santa made his first Macy’s Thanksgiving Parade appearance in 1924, and then became comfortably ensconced into malls when they came to prominence in post-WW II America. Malls in America: where else would Santa, the very embodiment of consumption’s blessings for the youngest members of our society, be more apropos? The united values of consumption and materialism are effectively reinforced in American malls. The domestication of misrule moves forward, as the bearded and bellied commercial icon par excellence looks into the eyes of a child and all but promises her that her material dreams will be fulfilled – with a similar misrule social bargain – as long as she behaves. Ol’ Claus by Ferrell’s estimation is the national “symbol of material abundance and hedonistic pleasure.” Even so, the big old man has a religious aura – he’s supernatural and omniscient, somehow all-knowing of our activities, good and bad. In Santa’s kingdom, the nice receive pleasing gifts and the naughty get a second chance. And just like that, with a twinkle in his eye, he gives his divine-like blessing upon our materialistic American Christmas. More Americans exchange gifts during the season than make traditional religious observance. What St. Santa represents – commerce, materialism, consumption – qualifies as the dominant religion of the land. In my book Just a Little Bit More: The Culture of Excess and the Fate of the Common Good I argue that this dominant religion or ultimate concern (to use theologian Paul Tillich’s phrase) has for the most part been a good religion that has fed, clothed, sheltered, and employed millions – lifting many of these from the grips of economic poverty. But when this religion goes too far, and becomes an end in and of itself – the religion breaks bad and the societal common good suffers. Our unexamined proclivity to trust in economic growth as the healer of all our ills is misguided; economic growth has done its good work for American society, but we’ve reached a point of diminishing returns. Further gains in income and wealth for affluent societies don’t give its citizens the improvements once seen in the societies’ earlier and less affluent days. Since 1980, economic gains in the United States, going mostly to the richest Americans, have unfortunately helped exacerbate social problems related to inequality: mental illness, teenage pregnancy, obesity, incarceration rates, and (decreasing) upward social mobility rates. Many of these problems directly and indirectly affect American children, one out of every four of them living in poverty in the richest country in the history of the world. It’s naturally based in history that the Northern Hemisphere’s season of winter solstice and accompanying holidays come with a touch of excess celebration, leisure, and the sharing and consumption of material goods. The grand majority of us look forward to and appreciate the December/January holiday season. It’s good to have a change of pace and break from that which the rest of the year consists: work and necessary routine. Santa, the quintessential icon and patron saint for a highly consumerist society, tells us quite a bit about our own character and identity as a society (and what it is we teach our children). Does it all boil down to this: If we have enough stuff we’ll be alright? This blog post and others on this website are representative of my views and writing in Just a Little Bit More: The Culture of Excess and the Fate of the Common Good, distributed nationally by ACTA Publications, and available at Amazon or any other bookselling venue. My second book, There is a Balm in Huntsville: A True Story of Tragedy and Restoration from the Heart of the Texas Prison System (Walnut Street Books) will be released on April 1, 2019.